The Artgerm Trade Dress Variant is up for pre-order now as well. Both covers are out March 21. 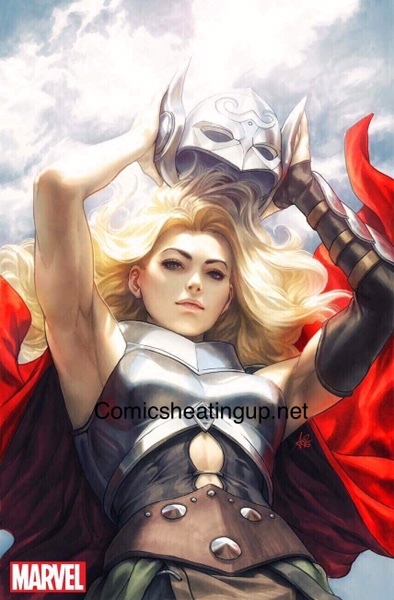 This issue will contain the “Death of Thor” (Jane Foster Thor that is). With the resurrection Virgin Cover, from your experience do you think it’s better to sell now or will it get more and more valuable with time? I’m at a point now where I have a large stock of books and all are profit, as in my total investment into comic books have already been returned on top of the stock I have. So basically I’m quite happy to sit on them but at the same time don’t want to lose out if they’re going to go down…..
Ps big thank you to you as I wouldn’t be in such a profitable position as I am without your regular updates!!!! I don’t like to sit on anything. Phoenix is an established character with many keys. I don’t see the need to hold on to books. I try to sell at the best times (Birthright in the past 24 hours for example) but sometimes the best time never really arrives. Sell to pay off what you spent and you break even and hold the rest. Or sell and take the profit. I may pre-order one of these maybe.